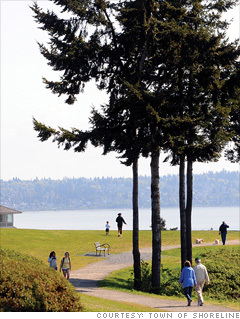 This relatively new town outside Seattle offers gorgeous views from sandy beaches of the Puget Sound and countless parks for its residents to roam through. There's plenty to do, with shopping centers, picnic areas, scenic walking and bicycling trails, and four art galleries. The Shoreline Arts Festival in June is one of the city's largest events; you can tour a series of art shows, listening to music, enjoying local cuisine, and seeing a children's theater performance. Unfortunately, houses here can be pricey: They range from $300,000 to $2 million or $3 million. --B.D. Is Shoreline a great town, or what?